Shannon Easter, Director of Sustainability and Golf Maintenance at Broken Sound Golf Club has been using Holganix Bio 800+ Golf for 5 years now. According to Shannon, Holganix Bio 800+ Golf has served as a tool to meet his sustainability, soil health and agronomic goals at the two courses he manages at Broken Sound. 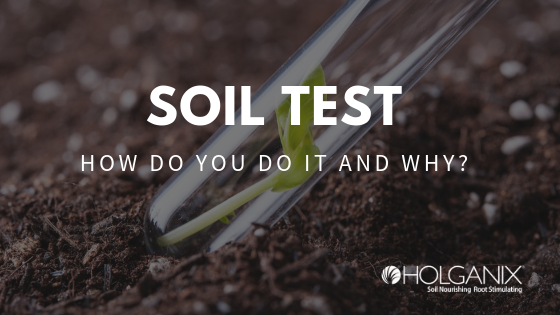 In this blog we’ll explore the results Shannon has seen with Holganix Bio 800+ Golf over the years with a reflection by Holganix Director of Soil & Plant Science, Dr. Robert Neidermyer on the science behind those results. Both a written section and video clips are provided from the interview for your use. If you are reading this blog via email, click here to access a copy of the article that contains videos. What is Holganix Bio 800+ Golf? Holganix Golf is a member of the Bio 800+ family of products. 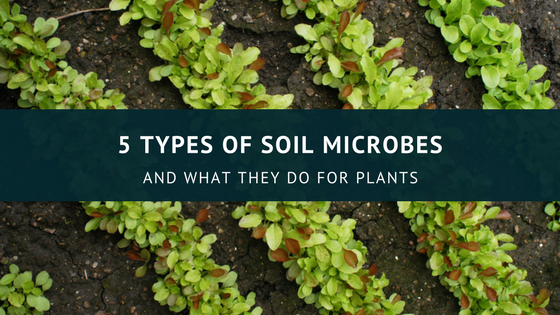 It harnesses the power of over 800 species of soil microbes to build soil health, stimulate root growth and grow stronger plants that require fewer fertilizers and pesticides to be healthy. Broken Sound Golf Club isn’t new to the world of sustainability. In fact, the exclusive, award winning country club was “the second golf facility in the US and the 14th in the world to be GEO certified - the sustainability assurance of the international non-profit Golf Environment Organization.” Broken Sound has also received Audubon Sanctuary Certification for both of their golf courses and established the first industrial composting project in Florida. In addition, Broken Sound has been recognized for recycling 96% of its solid waste. “In the state of Florida, we are the second largest recycler - just behind Waste Management,” says Shannon Easter. 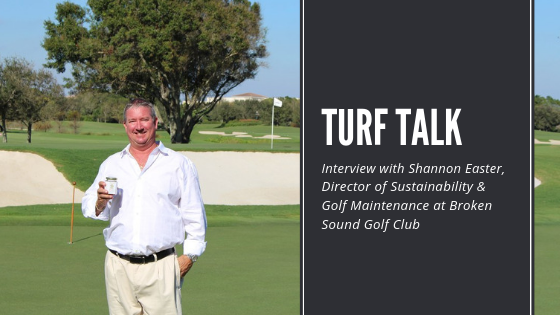 In 2016, Shannon accepted the coveted Environmental Leaders in Golf Award (ELGA), presented annually by GCSAA and Golf Digest in partnership with Syngenta and Rain Bird’s Golf Division. Holganix: Shannon, can you comment about how you use Holganix Bio 800+ Golf to reduce your fungicide, fertilizer and irrigation needs on both courses? Shannon: Holganix Bio 800+ Golf allows us to maximize the fertility in the soil and make it available. Overall, we have reduced our fungicide inputs by 30% and our use of nitrogen by 20%. Our irrigation has also been reduced by 12%; that’s because Holganix Golf has allowed us to grow a deeper, more web-like root system. We create tailored programs for each course because of their different soil types. For example, the old course is predominantly sandy soils and the new course has richer soils. In the old course we apply 4 applications via fertigation and on the new course we apply just 3 applications. We haven’t just backed off rates on our turf, but also on our annuals. 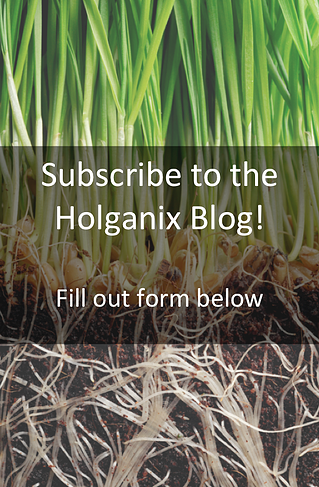 We mix the Holganix Golf with our compost and use it when planting annuals. Over the past 3 years we haven’t needed a single fungicide application on our annuals and I attribute that to Holganix Golf. Holganix: Dr. Bob, can you tell us about the science behind Holganix Bio 800+ Golf and why Shannon has been able to reduce his inputs? Dr. Bob: The microbes contained in Holganix Bio 800+ Golf are going to conduct three core activities in order to help maximize Shannon’s use of fertilizer, fungicides and irrigation. 1. Microbes in Holganix Golf promote root development which will allows roots to better access nutrients and water in the soil. A class of microbes known as Plant Growth Promoting Bacteria (PGPB) form a synergistic relationship with the plant to build plant roots. PGPB stimulate direct root growth of the primary roots - those roots that grow down into the soil, others stimulate root growth of the secondary roots - those roots that grow laterally or horizontally in the soil. 2. 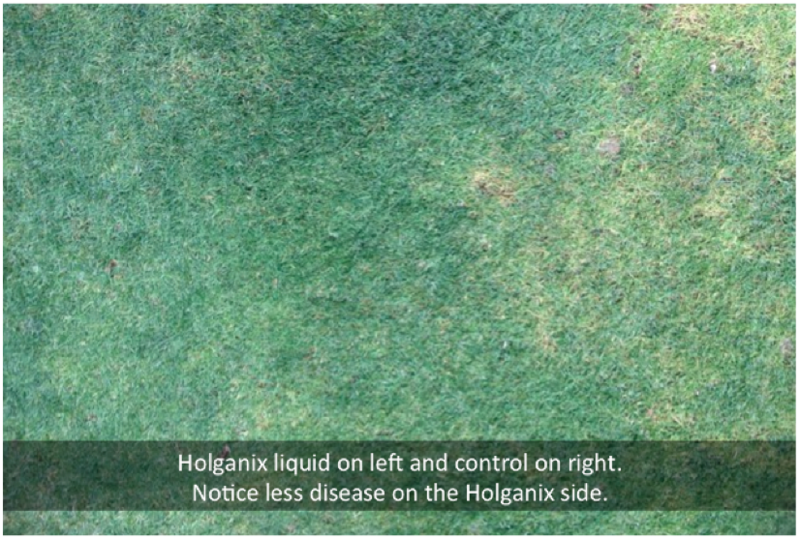 Microbes in Holganix Golf unlock primary and secondary nutrients already in the soil. 3. Microbes in Holganix Golf trigger the plant’s natural defense system called Induced Systemic Resistance (ISR) and Systemic Acquired Resistance (SAR) that combats pathogens or allows the plant to better handle situations like a drought or dealing with an abundance of water. What happens between the plant and the microbes is a kind of chemical dialogue. Microbes also help through competitive displacement by occupying space around and on the plant that might have allowed pathogens close to the plant. Holganix: Shannon, you alluded to the fact that you were able to reduce your irrigation because of the root mass. Can you talk to us about what you have seen with Holganix Golf and roots? 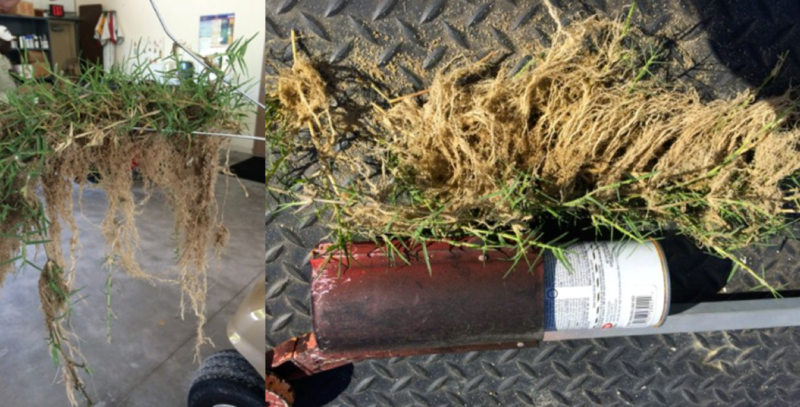 I know you were our 2015 Holganix Roots For You winner for having the most impressive root mass in the golf industry. Shannon: Take a look at the two pictures below. The one on the left is with celebration turf on the new course. The turf is just 4 weeks old in that picture and it is growing in sandy soils. Those roots wound up being 22 inches long! It is pretty impressive. The picture on the right is from turf just 11 days old. That area received a second application of Holganix Golf, so it really shows the potential if you can double up your application rate. Holganix: Dr. Bob, can you tell us what about Holganix Bio 800+ Golf that allows Shannon and other turf professionals to get such a deep root mass? Dr. Bob: It comes back to the PGPB and the plant growth hormones they release to grow primary and secondary roots. Holganix: You had sent us a bunch of data regarding a bump in soil health with Holganix Golf. In specific, you pointed out an increase in your cation exchange capacity (CEC) and a decrease in your soil organic matter. Can you tell us a little about those results? Shannon: CEC is the soil’s ability to hold onto nutrients in the soil and make them available to the plant. So, the higher I can get my CEC the easier it is for my turf to access nutrients. The data below demonstrates these results, showing a 13% average increase in CEC on fairways and a 27% average increase on greens. Our Soil Organic Matter (SOM) also decreased with the use of Holganix Golf on our greens. That means the thatch is being minimized and allows us to go longer in between renovations. 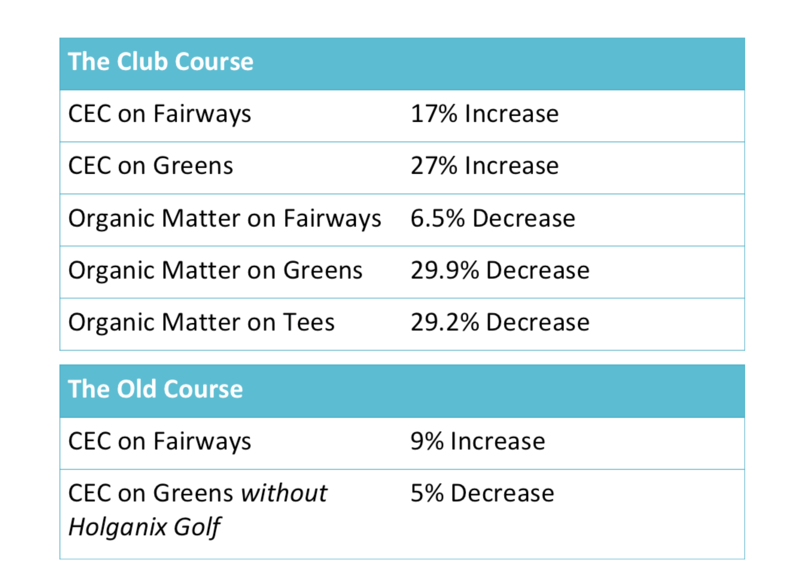 Overall we saw a 29.55% average decrease in our SOM on the new courses’ greens and tees. Bland Cooper who was our PGA Tour agronomist took a pressure test of our greens. It was the first time he got 10 pounds on greens that are over 12 years old. That just shows you how incredible it was to reduce our thatch and increase CECs. Holganix: Dr. Bob can you tell us a little bit about why Holganix Golf would be able to provide such a considerable boost in soil health? Dr Bob: Microbes in Holganix Bio 800+ Golf contribute to soil health because it’s microbes nature to break down organic matter. 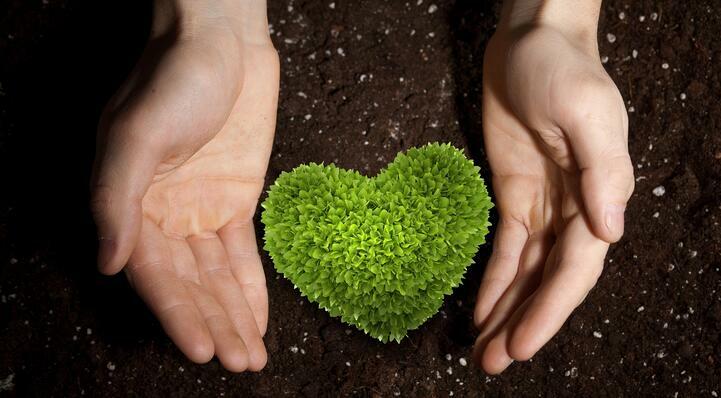 A healthy soil is dependent upon the soil’s ability to break down organic matter into humus. 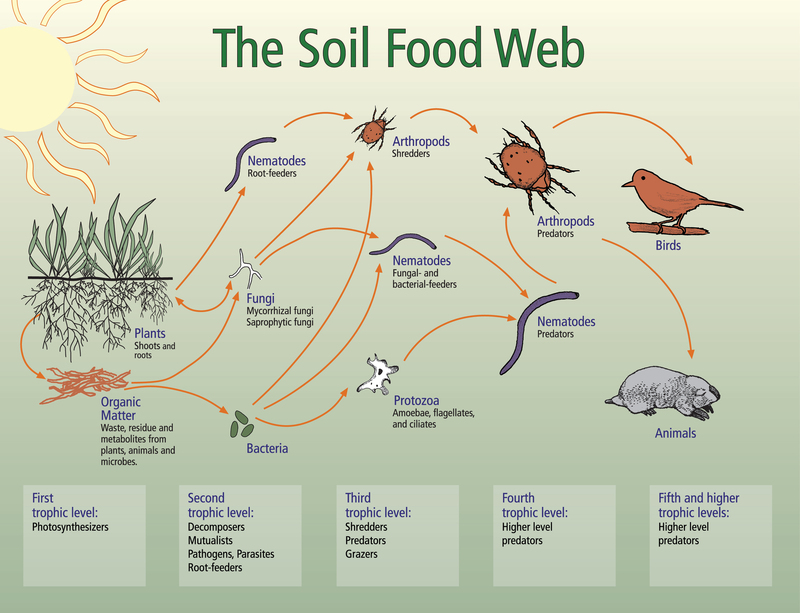 If organic matter doesn’t break down, disease occurs in the soil. Ultimately, this process leads to improved soil structure which leads to an increase in CEC, moisture movement and soil atmosphere movement. Holganix: Shannon, you used Holganix during renovations in 2014 and 2018. Can you tell us about the results you saw? Shannon: We really saw an increase in the speed that the turf was growing in at. Specifically, in the 2014 renovations we were able to open one course six weeks early and the other eight weeks early. One of the reasons why the courses opened early was because Holganix Golf allowed us to increase our grow in speed. Holganix: Dr. Bob, can you tell us how Holganix Bio 800+ Golf can help other courses during a renovation? Dr. Bob: For renovations it comes down to roots. 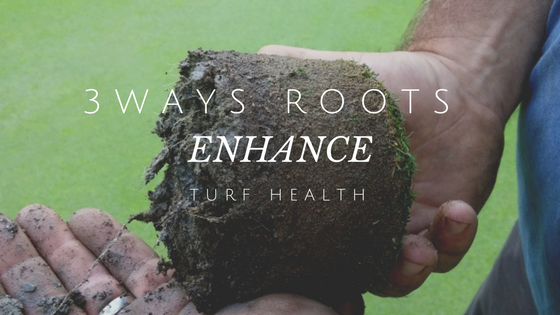 When establishing a new turf - whether it be a lawn or a golf green - success is critically reliant on developing a strong root system. Microbes in Holganix Golf that contribute to root growth include but are not limited to PGPB, Mycorrhizae and Trichoderma. If you want to learn more about Shannon’s results with Holganix Golf, check out the below video and article topics. 1. Nematodes - Shannon discusses results he has seen with an unnamed Holganix Technology and nematode reductions. 2. Soil Health - Shannon digs deeper into results on CEC and Soil Organic Matter (SOM). 3. 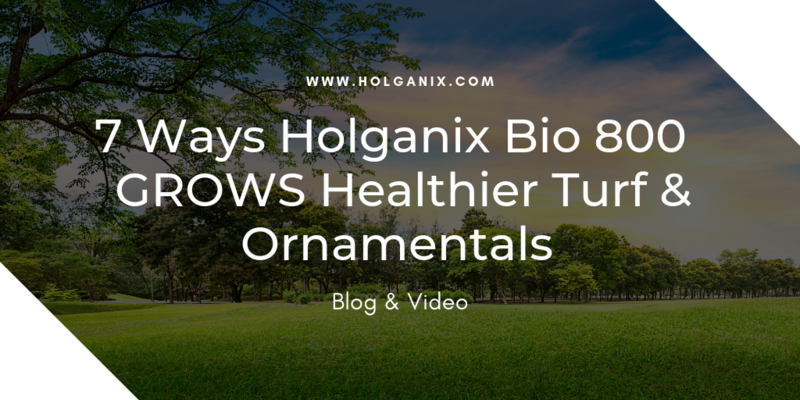 Plant Installations - Shannon discusses how he uses Holganix Golf when planting annuals and on trees and shrubs to ensure survival at planting and to build overall plant strength. 4. Golf Trends - Shannon goes into two key trends he is seeing in the golf industry that he feels superintendents should be aware of. 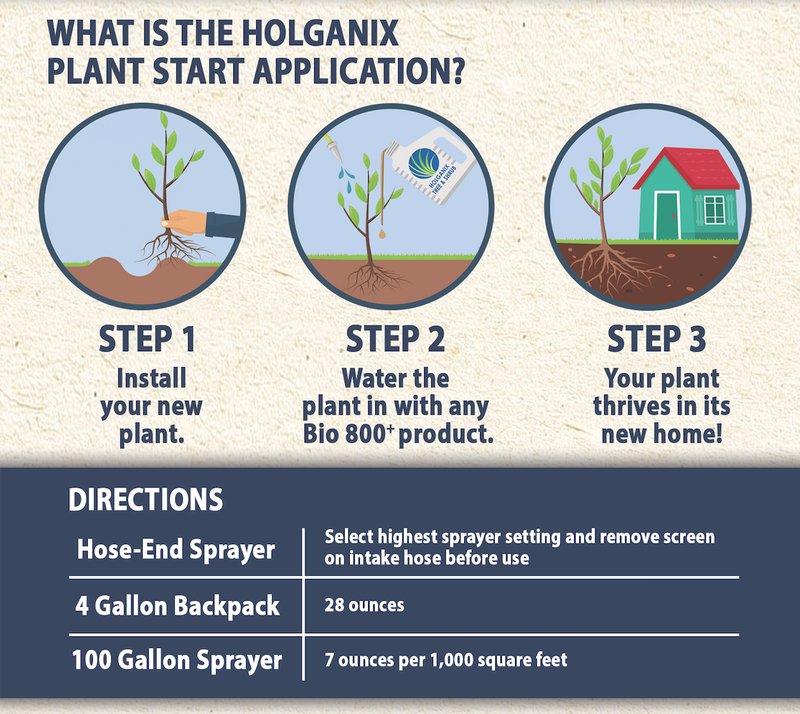 Want to learn more about the Holganix Golf product, download our ingredient list using the link below and be sure to give us a call at 866-56-EARTH to get in touch with one of our representatives! In plant health, roots are often neglected. As the saying goes, out of sight, out of mind! Yet, roots are fundamentally key to plant health. Root systems, which consist of one fourth to one third of a plant’s dry weight, are in charge of important functions for the plant. If a plant’s root systems are unhealthy, it can pose serious consequences for the plant. In fact, according to Colorado State University, “Eighty percent of all plant disorders are soil/root problems.” That means we need to pause and give these plant segments the attention they deserve. Why are root systems important? The plant becomes stable because of the roots, which safely hook the plant into the soil. Another thing to note is that the threat of soil erosion is lessened because of healthy root systems. Nutrients and water enter the plant through the roots. In turf, this means a vast root system is key to tap into available nutrients and water within the soil. The better the roots can reach sources of nutrients and water, the less service providers need to apply additional resources. When Mother Nature comes calling, plants with healthier root systems have the advantage over plants with weak root systems. This applies not only to weather conditions like a hot, dry summer, but also to pests and disease. In fact, healthy roots react faster to pesticides and fungicides than unhealthy root systems. Looking to increase the health of your plants’ root system? 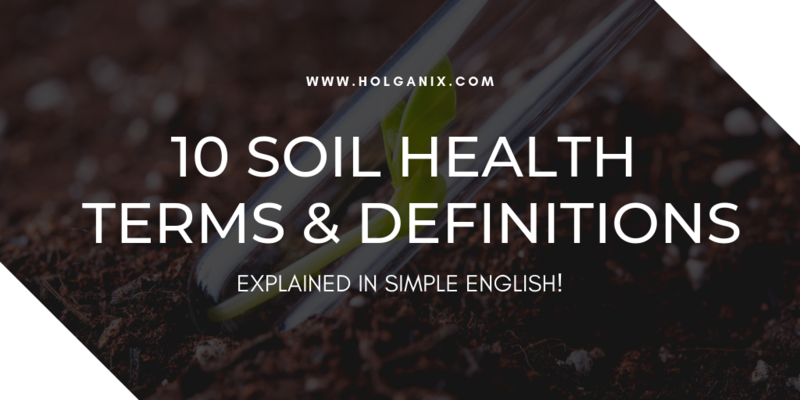 Some recommended practices include aeration and seeding and increasing the soil’s microbial activity with plant probiotics like Holganix Bio 800+. In fact, Holganix Bio 800+ contains several ingredients that influence root growth including: plant growth promoting bacteria (PGPB), trichoderma fungi and more. 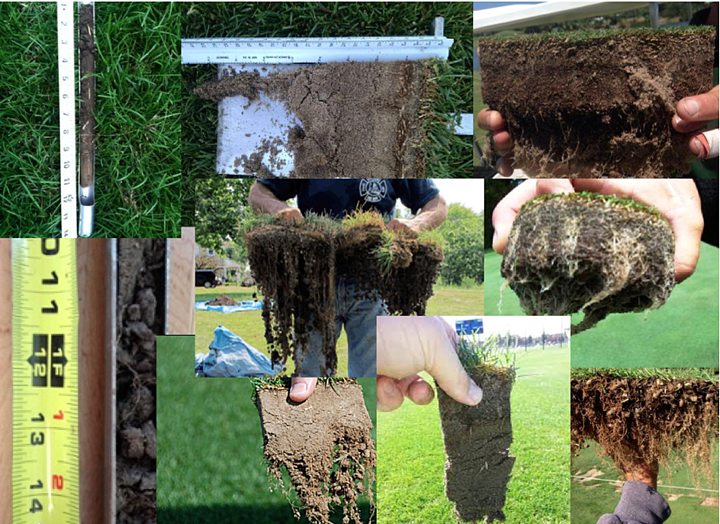 To dive into best practices and additional information around the science of roots, download our free ebook: Turf Roots using the link below. Organic isn’t a fad – in fact, according to the Organic Trade Association (OTA) 82% of U.S. households buy organic with millennials representing the largest group of organic buyers in America. That may not seem like a large number to you, but consider that today 25% of millennials have families and that in 10-to-15 years, that number is expected to increase to 80%. Can you consider how these new families will affect the consumer market – whether it’s groceries, cleaning products or lawn care, buying organic matters to the millennial consumer. When the OTA asked parents why they purchase organic produce over conventional, 30% of parents stated they purchase organic to avoid pesticides and fertilizers. That fact matters to organic farmers but it is also big news for today's lawn and landscape businesses. If parents are purchasing organic produce to avoid fertilizers and pesticides, that attitude translates to how they purchase lawn care services. Check out our infographic below for five key stats fertilizer users like you should know about the organic market. Market conditions aside, why else should you consider using an organic fertilizer program? As stated above, market data suggests that consumers either prefer organic or are interested in organic products and services. Market conditions aside, there are several clear benefits to using an organic fertilizer or hybrid organic fertilizer program over a conventional fertilizer program. Differentiate Your Business – Whether you offer produce, plants or lawn care services, you can differentiate your business from the competition by offering an organic option. 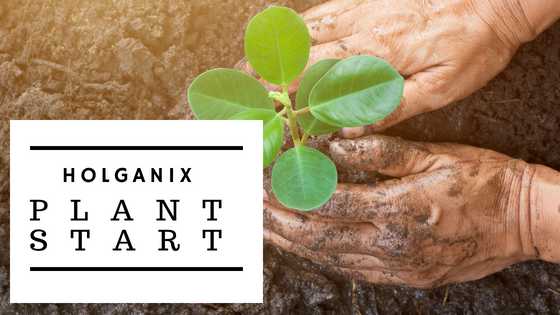 Build Healthier Plants – Organic products often contain additional ingredients like microbe food, microbes and biostimulants. These additional ingredients promote plant development. 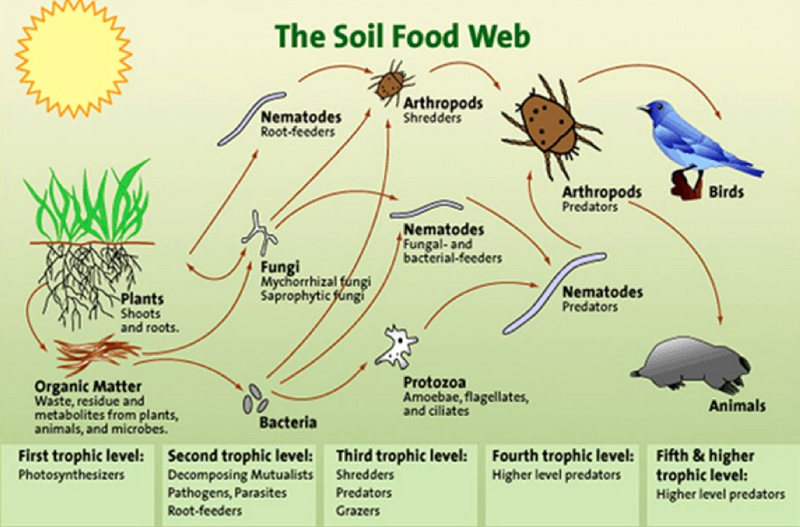 For example, microbes convert nutrients locked in the soil and atmosphere to foster plant growth. Biostimulants increase the plant’s ability to uptake nutrients, also affecting growth. 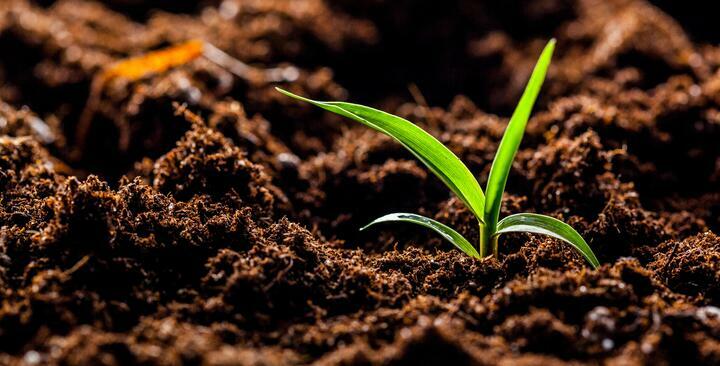 Better For Soil Structure – Utilizing an organic fertilizer program often means you are infusing the soil with microbes and/or organic matter that will build soil structure. 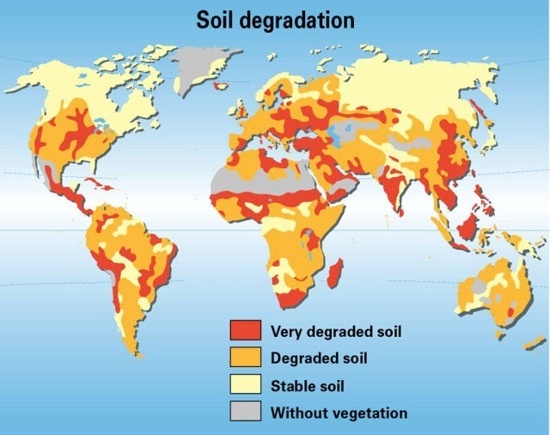 Soil is the foundation for plants – if you nurture plants in unhealthy soil conditions they are less likely to thrive than if you nurture them in healthy soil conditions. Better For The Environment – Fertilizer may runoff into our water ways, potentially depleting marine life or causing pollution to ground water. Do you want to go fully organic? When you are looking at incorporating organics into your fertilizer program, you have to consider whether you want to go fully organic or with a hybrid organic program. Regardless of the product you decide to implement, organics work more slowly than traditional chemical fertilizer products and it is important to set your customer’s expectation accordingly. Looking at a hybrid program allows you to combine the benefits of an organic with reduced amounts of chemical fertilizers and pesticides. That means your customer can still expect the quick results of a traditional program while still maintaining the benefits of an organic one. Holganix Bio 800+ products allow fertilizer users to reduce the amount of fertilizers and pesticides needed by 50 – 75% while still providing the results at par or better than a traditional chemical program. Bio 800+ products are plant probiotics that team with over 800 species of soil microbes that convert nutrients in the soil and atmosphere. Holganix Bio 800+ also boosts plant tolerance when faced with stressful conditions. Watch our 1.5-minute video below on the benefits of Holganix Bio 800+ products than click here to explore different product options available. As Thanksgiving approaches, we've compiled 3 reasons why Holganix is thankful for turfgrass this season and why you should be too! Turf areas represent the largest carbon sink in the US, sucking up and storing greenhouse gas from the atmosphere. Turf also converts carbon dioxide into oxygen. In fact, the grass and trees along the US highway system release enough oxygen to support 22 million people. Turf also helps filter pollutants from run off and can purify and recharge ground water supply, protecting America's water systems from harm. Grass areas affect people's moods by creating feelings of serenity, privacy, thoughtfulness and happiness. Furthermore, its yearly cycles of growth and color change lift human spirits and link urban inhabitants with their countryside heritage. A well-manicured lawn can boost the selling price of your home by 15%! In fact, a Gallup Survey reports that 62% of all US homeowners felt an investment in lawn and landscaping was as good or better than other home improvements.